When auto writers drive test cars, they're usually loaned out from carmakers' regional fleets. So when we asked for an 2012 Nissan Versa sedan to test over a four-day weekend, following our brief test drive of the all-new Versa in May, the car we got seemed rather familiar. It was, in fact, the exact same car. Or at least an identically equipped model in the same color (we forgot to check the VINs). 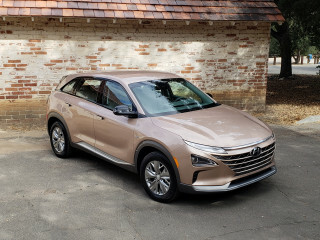 Our drive, which covered almost exactly 300 miles, gave us an overall gas mileage of 33.3 miles per gallon--right in line with the car's EPA combined rating of 33 mpg (30 mpg city, 38 mpg highway). As usual, our trip was about two-thirds highway miles and one-third local traffic. The 2012 Versa sedan is all-new, and while it's marketed as a subcompact, it has more rear-seat room than pretty much any other subcompact. Measured on interior space alone, this car can be viewed as a viable competitor for larger and pricier compact sedans. But the Versa is marketed as an inexpensive car, with the base-level 1.6 S starting at a remarkable $10,990 with a five-speed manual transmission. Our Versa SL high-level model, as tested, came in a whopping $6,200 higher, including a continuously-variable transmission (CVT) and convenience features like power windows and mirrors. That transmission, the first of a new generation of Nissan's CVT, is a mixed blessing. It clearly helps with fuel efficiency, by matching the most efficient engine speed to the power demands. But as with all such transmissions, the disconnect between engine noise and road speed can be disconcerting to new drivers. The Versa is mostly quiet to travel in, but under maximum acceleration, the engine howls while the car appears to gather speed fairly slowly. We didn't test acceleration times, but we certainly noticed that we had to floor the accelerator to maintain speed on hills. It also lurched occasionally in quick power-on, power-off transitions, something we haven't experienced in previous Nissan CVTs. The electric power steering works fine, but is relatively numb. On the other hand, this isn't a car people buy for its handling or roadholding. Styling both inside and out is rounded, with the small wheels giving this long subcompact an elongated, tall appearance that looks slightly out of scale. Sitting behind the wheel, the driver's seat feels slightly plumped up and round. That's the opposite of another car we happened to test, whose heavily bolstered seats held riders firmly in place. The dashboard is made entirely of hard plastics, but Nissan has textured and styled them in such a way that it doesn't look cheap--unlike, for instance, the grim-looking surfaces of the 2012 Honda Civic. The main instrument cluster and major controls are easily usable, and despite its small screen size, the optional navigation system worked well. Still, we found some secondary controls to be oddly placed. While the inside trunk-lid release is a lever on the floor next to the driver's seat, the fuel-filler release button is at the extreme bottom of the dash--above the driver's ankles and completely invisible when sitting at the wheel. While the quality of our Versa was generally good, the power door-mirror switch on the dash was atrocious. It felt like a cheap Chinese toy, with light presses having no effect and a harder push suddenly yawing the mirror past where we intended. It literally took a couple of minutes to get the mirrors properly adjusted--versus, what, 15 seconds all told in other cars? 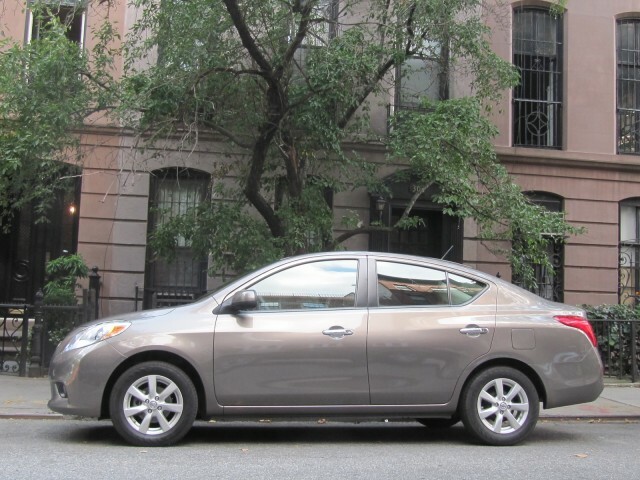 The test car, a 2012 Nissan Versa 1.6 SL, had a sticker of $17,190, including a mandatory $760 delivery fee. 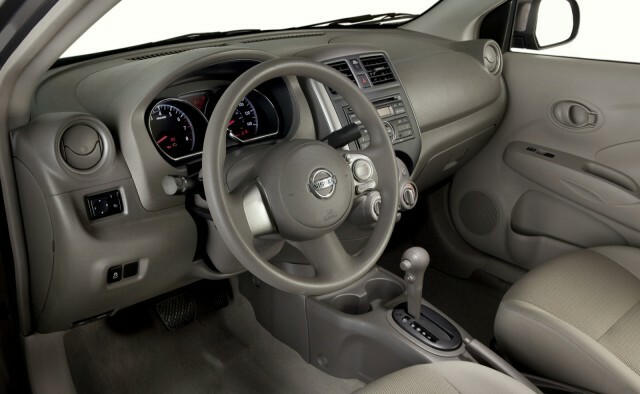 The Versa SL includes 15-inch alloy wheels, a 60/40 split folding seat back in the rear, audio controls on the steering wheel, and iPod control and Bluetooth audio connectivity. That's a base price of $15,560, plus a $700 technology package with a navigation system using a 5-inch in-dash display, satellite radio, and a USB connection, plus carpeted mats for the floors and trunk ($170).